The belly has long been my favourite part of the pig. There are two things I generally prefer to do with a pork belly; either salt it and cure it to make dry-cured bacon, or braise it long and slow, for about 12 hours, then press and chill it before roasting it until crispy. Pork belly cooked this way has the most amazing mouthfeel; the meat itself is succulent and has fat running through the layers that melts in your mouth, and the skin that sits atop is the most fantastic crisp pork crackling. It’s a great contrast of textures! Heat the oven to 140C. To cook the pork belly, season it with 1 heaped teaspoon of fine salt and rub it into the flesh and skin side. Line a roasting tray that just fits it in snugly with greaseproof paper, and add water until just covered. Add a sprig of thyme and a few sage leaves, then place in the oven for 10-12 hours, until it is absolutely tender and almost falling apart when touching it with a spoon. Remove the liquid from the tray, and set aside. Now cover the belly with another sheet of greaseproof paper and press with another tray on top, followed by a heavy weight (2-3kg). Place in the fridge to chill for at least 6 hours. To make the pork and ale sauce; take the reserved bones from the belly and cut into small pieces using a cleaver or a heavy pair of scissors. Cut the carrot, leek, onion and tomato into approx 1cm dice, and set aside. Lightly crush the garlic. In a large, heavy based pan, heat about 2 tablespoons of vegetable oil over a high heat. sauté the bones until golden, then strain in a colander. Reduce the heat to medium, and in the same pan, cook the vegetables with a generous pinch of salt for about 10 minutes. Add the pork bones back in, along with the rest of the thyme and a few sage leaves. Add the ale, and bring to the boil. Reduce until the liquid is completely gone, then add the reserved cooking liquid from the pork belly. Bring to the boil, and reduce until dry again. Add enough chicken stock until just covered, then simmer gently for 30 minutes. Pass the sauce through a fine sieve, and reduce by half, or until you have an intense flavour. Whisk in some beurre manié to thicken, adding just a little bit at a time. Set the sauce aside. Heat the oven to 180C. Portion the pork belly into 4 equal sized pieces, and score the skin carefully in a criss-cross pattern. Add 3-4 tablespoons of vegetable oil to a large heavy based pan (with an oven-proof handle), then add the pork skin side down and place over a high heat. When it just starts to sizzle, place in the oven for 20 minutes, or until the skin is golden and very crispy. 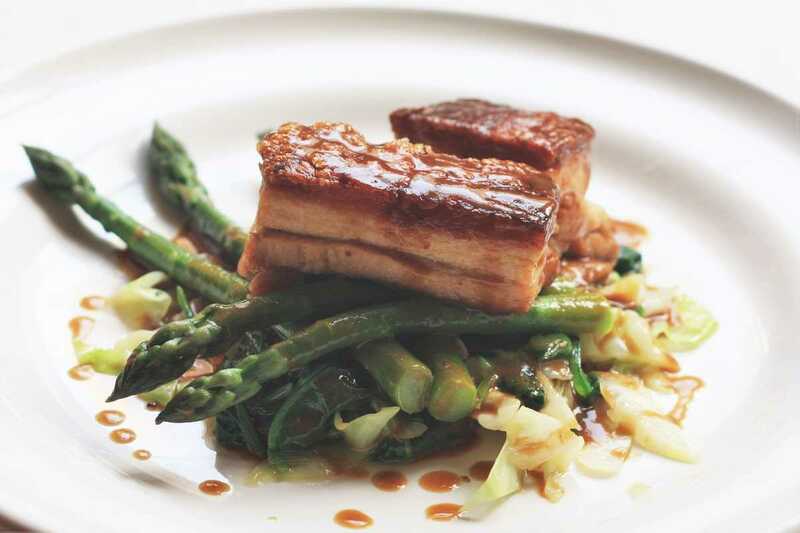 While the pork belly is cooking, prepare the vegetables; fill a large pot with water and season generously with salt. Bring to the boil. Cut off the bottom 1-2 cm of the asparagus as it is woody and tough. Remove the outer 2 or 3 layers of the cabbage, and cut out the thick veins. Slice coarsely. Wash the baby spinach leaves, then set aside. When the pork belly is about 5 minutes away from finished, heat the butter in a large sauté pan until foaming, then add the cabbage along with a pinch of salt. Cook until tender. Cook the asparagus in the boiling salted water until just tender - about 4 minutes. Finally, add the baby spinach to the pan with the cabbage and cook until wilted. Serve the pork belly on the bed of vegetables, and pour the sauce over.